Come and meet the incredible Ski Dubai Snow Penguins! Say hello to the cute colony of Gentoo and King Penguins who call Ski Dubai home. Enjoy a rare and personal encounter with these wonderful creatures by booking one of our amazing Snow Penguin packages. 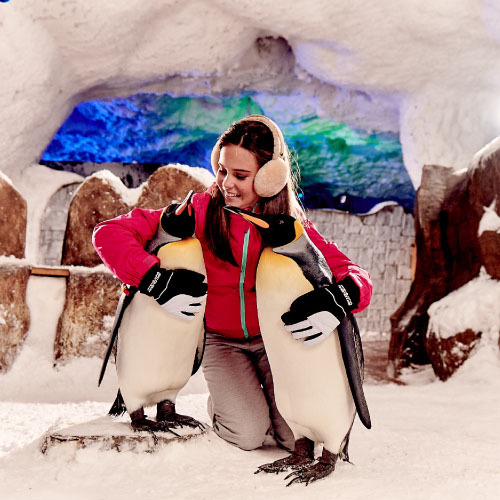 Meeting our Snow Penguins is one of the top things to do in Dubai. This is definitely one experience you will treasure forever! Join us for an incredible Peng-Friend Encounter, and get to know our iconic Gentoo and King Penguins a little better. 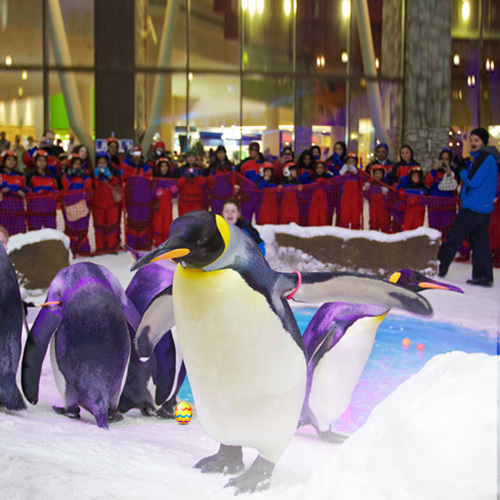 Enjoy more at Ski Dubai, with a Snow Plus Pass and Penguin Encounter! Get the best of both by booking this joint package today. They are the third largest penguins, following the Emperor and King Penguins. They are actually birds and they lay eggs! They have a white "cap" extending from their eye to eye over the top of their heads. There are more than half a million Gentoo Penguins living in the wild. They use nesting materials ranging from pebbles and molted feathers in Antarctica to vegetation on sub-antarctic islands to build their homes. They are the second largest penguins, following the Emperor Penguins. They too are birds and they lay eggs! They have a black head, chin, and throat, with vivid orange, tear-shaped patches on each side of their head. Their total population is estimated to be around 2.23 million pairs and is increasing. They walk slowly and do not hop. Story :Hadi is the oldest penguin in our colony. He is usually very calm and quiet as to why he is called Hadi, meaning ‘calm or quiet’ in Arabic, although he does like to swim a lot. Most trainers say Hadi has got the most beautiful eyes of all the penguins as they’re very light colored. Penguins’ eyes have a 3rd eye lip which is called a nictating membrane. Story :When Paul had just arrived in Ski Dubai, trainers called him ‘Nippy’ because of the way he eats his fish. He nips to grab the fish, then flaps it around a couple of times, and then eats it head first... He still does it! Paul usually spends a lot of time in the pool, but also spends a fair amount of time with his wife Bubbles. Penguins are known to mate for life, always returning to the same partner and nest every breeding season. Story :Jumeirah was one of the few penguins who came over to connect with trainers right away, only within hours of arriving at Ski Dubai. He instantly wanted attention, and he was also called ‘the buddy’ because of it. Jumeirah was named by Mr. Majid Al Futtaim. Jumeirah is usually not the first penguins to go out and explore new things, he prefers to ‘follow the colony’. Penguins have been known to travel in numbers whether they are in the ocean or on the land. Story :Even though McFatty is not the oldest penguin, he surely is the most dominant one. He likes to boss the other penguins around and often claims the attention of trainers, not letting other penguins come close to ‘his’ trainers and ‘his’ guests. He was named McFatty because he had problems coming out of his egg when it hatched, he was so fat! Penguin chicks have what some call an “egg tooth” that they use to break out of an egg. Story :WallE was called WallE because he loves to stare at walls! Anytime he sees a ‘new’ wall, he loves spending time exploring it. For him, it doesn’t matter if it’s a snow-wall, a fence, lights on a wall, picture panels or any other wall, he loves them all. WallE also loves spending time with his human friends as he’s an incredibly loveable penguin. Some penguins take part in allopreening which is a form of mutual grooming. Story :As the oldest female penguin of our colony, Mona Lisa is a real diva. When she first arrived to Ski Dubai, she only wanted to eat two fish at the same time, though she quickly learned that one fish at a time is ‘okay’ too. Mona Lisa loves cleaning her feathers a lot, which is similar to you brushing your hair. Penguins have special preening gland that produces oil so they can spread it all over their feathers, making it water proof. Story :Like many other types of birds, penguins love shiny things. Bubbles was given her name as she really likes it when we blow bubbles for her, she just loves anything shiny! Out of all the penguins, Bubbles has a more insecure personality and she loves always having another penguin close to her, which is usually her husband Paul. Story :Squeaky has earned her name by constantly squeaking when she eats or even sees a fish. This ‘squeaky’ noise is usually a sound that chicks produce when they’re asking their parents for fish, and most penguins grow out of this habit not long after their parents stop feeding them. Squeaky still does it though, she might never grow out of it! Story :Amsheet is one of our younger girl King Penguins and she’s very much a princess. She was named by HH Sheikh Mansoor bin Mohammed bin Rashid Al Maktoum after a place in Lebanon. She is a calm penguin, and she’s the only King Penguin who always has her mind on climbing to the highest point in the area, be it a snow pile or a big rock, she conquers all. Even though penguins cannot fly they still like to be on the look out for predators and will find a higher spot to rest. Story :Cuddly might not be our youngest King Penguin, but she definitely seems the ‘smallest’ King. Being one of the youngsters, her colors have not fully developed yet and her ‘crown’ is more yellow than orange. Cuddly loves spending time with her trainers, and picks out favorites as well! She is a very smart and inventive girl. During training sessions she always tries to look for new ways to surprise you. 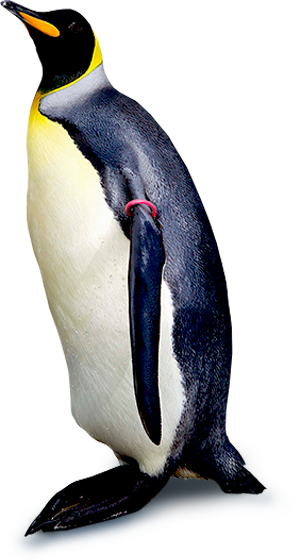 Adolescent King penguins can be identified easily as they do not have an orange stripe on their beak like the adults. Story :Mr Sim is one of our older Gentoo Penguin males and he is a pretty quiet one. But don’t let the fact that he’s quiet fool you, he is very smart and often tries to train his trainers. He is quite the womanizer, the Gentoo girls like his charm and he’s actually a very good singer too. Gentoo penguins are known to vocalise when they reunite with their partners after a long hunting trip. Story :When Lucifer arrived in Ski Dubai he was a very naughty boy! There seemed no other way to describe his personality than to name him Lucifer. He loved to steal fish and nip the trainers ankles. Since he’s been at Ski Dubai, he has changed a lot and he turned out to be a very smart boy that is always active and always looks for new challenges. Penguins can be especially territorial when they are nesting as they will have to protect their nest from thieving penguins and predators. Story :Myone is one of the penguins that arrived at Ski Dubai in January of 2014. Since her arrival, Myone has showed a big change in personality. She’s slowly coming out of her shell, changing from a shy penguin into a more outgoing penguin. She loves to chase dangly toys and enjoys being surrounded by other penguins. Penguins have very keen eyesight that enables them to see just as well in the water as they do on land. Story :Toby also arrived in January of 2014. He is very inquisitive and feels most comfortable being close to his partner Gummy. Toby has proved that penguins can see colour because he was trained to respond to a yellow target! When presented with 3 coloured targets he always go to the yellow one! He also likes to eat snow and play with ice. Not all penguins live in snow, some penguins are found in warmer countries like New Zealand, Australia, South America and South Africa. Story :Pebbles is a quiet, lovely Gentoo penguin girl! She was named after the little girl ‘Pebbles’ from The Flintstones by the trainers and has an unstoppable sense of curiosity. She loves exploring, climbing, meeting new people and is usually the first one to confidently explore new situations or areas. She has a strong relationship with her trainers and likes to follow them around. Pebbles are very important in a Gentoo penguins life as the male penguins will use it to propose to the females by placing it in front of her and bowing. Story :Mitty is our ‘smallest’ Gentoo Penguin, although she has a big personality. She loves to sit on her self-proclaimed rock that she wouldn’t leave for any other penguin to stand on. When penguins say ‘I love you’ they bow to each other and produce a hissing sound. Partners have been known to greet each other in this way as well as when parents reunite with their babies. Mitty loves saying ‘I love you’ to everything and everyone, especially when her trainers say Hi to her. Sometimes she even gets jealous when other Gentoo Penguins come too close to her trainer. Story :Sneezy is another one of the Gentoo penguin girls, and is actually Mitty’s sister, hatched only a day after her sister did. Sneezy was given her name due to the fact that she always sneezed a lot, but all penguins actually sneeze a lot! This is their way of getting rid of salt sea water from their nose (and no it’s not snot). Sneezy is also very inquisitive, and is usually very persistent in whatever she’s doing. She has to finish what she started before anything else and is probably the most vocal girl Gentoo Penguins. Story :Lollipop is an extremely sweet Gentoo Penguin girl, therefor the name Lollipop. She almost walks ‘carefully’, just like a princess. She has a very patient and understanding personality and she is one of our star-painters. Her being so calm and understanding though makes for the other Gentoo girls to sometimes tell her off, to make them feel they are the boss. Story :Pie is probably the most eye-catching girl for the Gentoo Penguin boys as she’s quite flirtatious. She feeds off her trainers energy, as it just depends on how you approach her. If you are excited, she’ll get excited too. Pie is also the most dominant female, and probably the most dominant Gentoo penguin in our colony, claiming her own territory. She loves playing with toys and playing ‘water games’ with trainers. Story :Gender: Female Out of the penguins who have arrived in January 2014, Shella learned in a very fast paste. Not only is she generally fast (running and swimming) but she’s also very attentive. She naturally acts like a leader for other Gentoo Penguins, as she knows what she’s doing. Others always seem comfortable following her as she radiates confidence. Story :Gummy is another girl who joined the colony in January 2014 and she has a little energetic ‘skip’ in her walk. Gummy loves it when her trainers throw krill in the water, she will race around trying to eat as much krill as she can before the other Gentoo penguins get it all. Penguins eat fish, squid and krill. Story :Krishma also joined Ski Dubai in January 2014. Krishma learns very fast, but likes to perform at her own pace. She loves to swim in the main pool, interacting with people looking at her through the glass. She’ll be watching you more than you’re watching her! She is always the 1st penguin to greet trainers in the morning, she greets by walking up to the trainers feet and bowing to them. This is a sign of respect in Gentoo penguin body language. Story :Pop was our first successfully raised king penguin that hatched at Ski Dubai. He is an incredible little individual. Pop was born with cataracts but that did not stop him from living a full life. He has always participated in guest encounters and has had a great confidence boost since his cataract removal surgery. His best friend Hug has been there with him through it all. Penguins are well known for forming close relationships between them. Story :Hug hatched only one day after hug. She has grown into a very independent individual and has no trouble in communicating her likes and dislikes. Once hug has bonded with one of her human friends she is very loyal to them and always chooses to make them feel special by cuddling up to them. Body language is an important way in which animals communicate with each other besides the obvious vocalization. Story :Little Lulu got her name from the great public of Dubai after a competition was run for name selection. Well…she isn’t so little anymore. Hatched from mom Squeaky and dad McFatty, who are both very calm accommodating penguins, Lulu herself is a little more spunky. Like her dad she loves attention but only from her favourite trainer and definitely not from any of the other penguins. She does not like to be rushed when walking around, I’m sure her favourite song is secretly “My Way”. Story :Hatched on Valentine’s day, Valentina was appropriately named. Initially her trainers thought she was a shy little boy but after her DNA test was done it turned out she was in fact a girl! Penguins are monomorphic which means that boys and girls pretty much look the same externally. At ski Dubai we do DNA tests so that we are absolutely certain of who is who. Story :Even though he is only half a year old, Chino is very well adapted to going on walks alone and exploring new areas. He has incredible trust in himself but still runs to mommy every time he sees her. It’s the sweetest! Penguin chicks are often left alone in groups while their parents go off to find food. Story :Amir is the most boisterous and dominant out of our 3 most recently hatched king penguin chicks. He is not shy to chase the other two away from receiving attention or from getting a comfy spot in their snow bath. He was the first out of the three to allow guests to touch him. The more you spend time with him, the sweeter he is with you. Story :Peeta is officially the first successfully reared Gentoo penguin at Ski Dubai, the first official Emirati Sub-Antarctic penguin! He happens to be our biggest Gentoo penguin and he does not stand for being pushed around! Peeta recently had a daughter, albeit very young as he was only two when he had her, named Marina which means we now have 3 generations living at Ski Dubai! Story :Now this is a mommy’s girl! Till this day she has not left her mom’s side. She has a very good memory and avoids any situations that may have made her feel uncomfortable before. She is incredibly sweet once she has bonded with you but it does take time as she is not as easily trusting as some of the other penguins. It takes a lot of patience to get to know her but it is so worth it! Story :Pecan loves the boys! Not penguin boys, human boys! She always says I love you to the boy penguin trainers even when she is supposed to be concentrating in her training sessions. She is a rather flirty little girl. Pecan is incredibly smart and was the first out of the baby penguins to accept touches from the trainers and participate confidently in encounters. She is so brave and curious, we don’t think anything scares her! Story :Zeus is a very little quiet boy, but has no problem making a noise when he feels annoyed by the other penguins. His trainers feel he may just be the fastest penguin on land in the colony as he runs pretty quickly for a penguin. He is not very adventurous but loves chasing fish in the water. A bit of a cuddle bug at heart, he puts on a brave show for the older penguins. Story :Marina is definitely her father’s daughter. At only 6 months she is very feisty and not afraid to stand up for herself! That being said she has also already started saying I love you which is unusual for a juvenile. The trainers spend a lot of time bonding with the penguins and this is what enables them to share their experience with our guests. 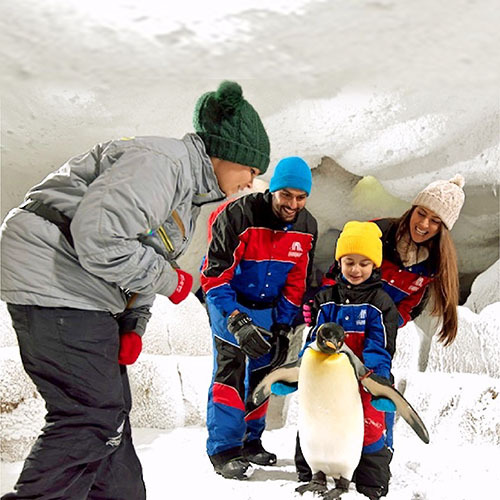 Snow penguins at Ski Dubai is dedicated to teaching youngsters and adults about the nature of this remarkable colony of Gentoo and King Penguins through engaging and interactive programs. This school program is the first experiential penguin encounter exhibit of its kind anywhere in the world. Students and their teachers will be given opportunity to be up-close with penguins swimming as they learn all about them in the fun and very unique professor Penguin School Program. Minimum 20 Students- Maximum 50 Students for every 10 kids, a teacher or chaperone joins the program for free! Do penguins have five toes just like us? And what do penguins eat? In an interactive classroom during the Professor Penguin encounter session, students will learn all of these fun facts abut Snow Penguins, their environment and much more! Every student will get to be up close for a peek of the Snow Penguins at Ski Dubai actually swimming and playing underwater. During every Professor Penguin Program, the most promising students will be chosen to actually meet up-close and personal (and even touch!) one of the Snow Penguins at Ski Dubai's King or Gentoo penguins inside Ski Dubai's Snow Cave. Whether they meet McFatty, Squeaky, Pebbles, Pumpkin or any of the other twenty penguins in the colony, these lucky students will have a memory that will last a lifetime. By the end of the Professor Penguin School Program, we hope that each student and teacher will be so attached to their new feathered friends that they will want to learn more about these amazing birds and what they can do at school or home to actually help all wildlife and their environment. 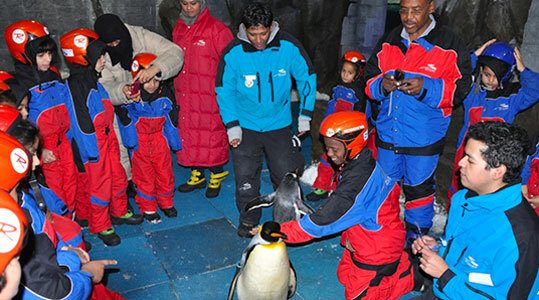 Upgrade your Professor Penguin Program to include a fun visit to Ski Dubai's Snow Park for only 75 AED per child. Note: Students and teachers are not allowed to bring in cameras, cell phones or any loose items. Our Digiphoto team will take pictures of the visit, these pictures are available in specially priced school packages. Each visit must be accompanied by one adult for every 10 children. Our Snow Penguins here at Ski Dubai are ambassadors for their species from all over the world. You can help out too by visiting us and becoming an official Peng-Friend here at Ski Dubai. All Peng-Friend funds will support our penguin conservation, education and research partners. To receive a Monthly Newsletter of your favorite penguin at Ski Dubai, just select a penguin below and sign up. We will keep you updated with the latest news and videos of your favorite Peng-Friends! Want to know more about your favorite penguins and how we take care of them? Ask us what's on your mind. A. Yes, penguins are birds. They have feathers, lay eggs and have forelimbs modified as wings, but in this case used for swimming. They also share all the other characteristics of birds, being warm-blooded (around 40oC) and having a reduced reproductive system (one functional ovary or testis). Q. What do penguins eat? A. The diet of penguins varies between species and in some cases, location. The species taken include a wide range of fish, squid, octopus and euphuists (shrimp-like animals). Some species of penguin target surface-schooling fish species while others are mid-water or bottom feeders. Q. How long do penguins live for? A. Most species have an average life expectancy of about 10-20 years in the wild and 15-25 under human care, although some individuals occasionally live for up to 30 years. Q. Do all penguins live at the South Pole? A. Not all penguins actually live at the South Pole, but two species do live on the edges of the Antarctic continent. The islands of the Antarctic and sub-Antarctic support the largest number of species; there are several species that live in temperate climates and one at the equator (the Galapagos penguin). No wild penguins live in the northern hemisphere. A. No, penguins use their wings (called flippers) to propel themselves through water rather than air. Because water is much denser than air, penguin wings are shorter and stouter than the wings of flying birds. Penguins are also much heavier than similar sized flying birds and have solid bones rather than weight-saving air-filled bones. While these characteristics enable penguins to efficiently "fly" through water, they have had to sacrifice the ability to fly in air to do so. Q. Do polar bears eat penguins? A. No, penguins cleverly avoid being eaten by polar bears by living in separate hemispheres!. Q. 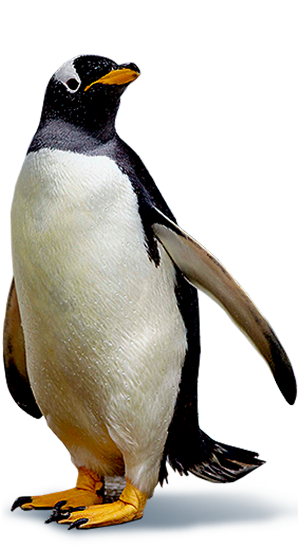 How many Gentoo and King Penguins live in the wild? A. Estimated, more than 3 million King Penguins. Estimated, more than half a million Gentoo Penguins. Different sources say different things, but neither species is presently under threat. Q. Are Gentoo and King Penguins endangered? A. No, Gentoo and King Penguins are not endangered at this moment. If there would be an oil spill, or a disease outbreak in a major breeding area, this could change within 24 hours. Gentoo Penguins are classified as 'Near Threatened', which means numbers of Penguin populations might be increasing on Antarctic Peninsula and South Sandwich Island, and might be decreasing on some islands. King Penguins are classified as 'Least Concern', which means numbers of Penguin populations are stable or increasing. Q. What does conservation have to do with penguins, and why is conservation important? A. We hope that by experiencing this unique, close contact interaction with our penguins, people will get a better understanding and appreciation of these extraordinary species, but also to appreciate their wild counterparts. Conservation plays a very important role in this, because we would love for our children, grandchildren and great grand children to still be able to see Penguins, and all other wild animals that are part of conserving this planet.